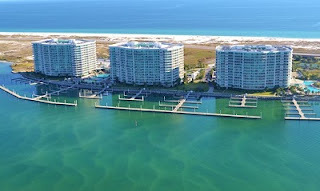 Orange Beach AL water-front condo for sale at Caribe Resort. Luxurious penthouse with spectacular views overlooks the Gulf of Mexico to the South, and Robinson Island, Terry Cove and Ole River to the North and also the impressive pools directly below. This 2BR/2BA top floor with approximately 1,600 square feet offers everything you need to call this your second home or investment property. The open kitchen design comes complete with stainless appliances, granite countertops, wet bar with sink and ice maker, and tile floors throughout with the exception of bedrooms being carpet. This unit would also be a great rental with all of the amazing amenities that Caribe has to offer, including multiple pools, and hot tubs, lazy river, arcade, putting greens, walking distance to award winning dining at Cobalt, and direct access to activities such as fishing charters and dolphin cruises. Comes fully furnished except for one picture above wet bar.